Getting started -- Your plant was grown in filtered light, not direct sun, so it should be started in bright shade or dappled sun, and slowly moved into more light over a period of a few weeks. This will give your plant time to adjust to sun without burning or wilting. Pot size -- I recommend starting your plant in a 1 to 3 gallon (4 to 12 liter) pot with potting soil, even if you plan on putting it into the ground later. Use well-draining soil. I use a mix of 1 part coir fiber to 1 part perlite . An alternate mix is 2 parts quality potting soil to 1 part perlite or coarse horticultural sand. Don't add lime unless you use peat moss in your mix. Growing onward -- Once your plant is at least 16 inches tall, you may plant in the ground (avoid heavy clay soils). If you're going to keep it in a container, repot it before it gets rootbound, to avoid stunting growth. Repot gently to avoid breaking apart the soil ball, which can damage the roots. To help keep the soil ball together, water the soil first. 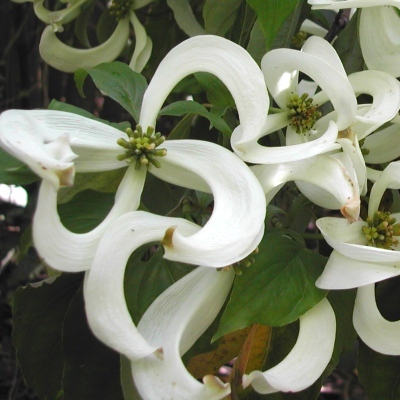 Climate -- This Dogwood prefers part sun, except in cooler climates, where it can take full sun. It does not need lots of direct sun to be happy. In warmer climates, it's best to give it some afternoon shade. Mature trees are said to be hardy in Zones 6, but i recommend protecting the plant from all frost the first 2-3 years, perhaps by moving the pot indoors over the winter, or by giving overhead protection. When the plant nears flowering size, it might need cooler nights in winter (below 55-60°F / 12-16°C) to encourage flowering, although i am not certain about this. Over about 40% humidity is best. Watering -- Aim to keep the soil evenly moist most of the time. Don't let it dry out completely, but don't keep it constantly soggy either. If you're unsure if the soil down in the root zone has the proper moisture, you can use a moisture meter . Fertilizing -- Feed twice during the growing season, in spring and again in summer, with a fertilizer that contains micronutrients (I use this). Pruning -- Pruning is optional. If you want it to have a short, bushy shape, pinch off the growing tip of the tallest stem, and this will encourage side branches to form. If you prefer a tall, tree-like shape, remove the lower branches. Bugs to watch for -- This will vary in different parts of the country. Dogwood borer might be a problem in prone areas. Indoors, watch for typical indoor pests like spider mites, mealy bugs, thrips, and scale. Try using insecticidal soap before using stronger remedies, since some may harm the plant.